Below are clinical studies that are currently recruiting research study participants. *If you are a VeDA professional member and would like to recruit participants for your research study, click here to submit your request. Objective: Learn more about spontanous/other onset MdDS patients - focusing on onset, symptoms, triggers, health/well-being and therapies. Participant Information: This online survey is for patients whose Mal de Debarquement Syndrome (MdDS) has clear cause of onset (spontaneous/other onset). You are invited to participate in a research study being conducted by Dr. Cherylea Browne and Dr. Rachael Brown from Western Sydney University, Australia, and Ms. Viviana Mucci from University of Antwerp, Belgium, in collaboration with Assistant Professor Mingjia Dai (Mount Sinai, U.S.A), Associate Professor Sergei Yakushin (Mount Sinai, U.S.A) and Dr. Shaun Watson (Prince of Wales Hospital, Australia). This research aims to contribute to the understanding of the underlying mechanisms of MdDS. Specifically, this study seeks to collate data regarding the basic clinical features of MdDS, which might be unidentified or overlooked due to the subjective nature of the condition. We aim to collect survey data from spontaneous/other onset MdDS patients, both within the state, nationally and internationally. Participation in this study involves completing an online questionnaire about your MdDS onset, symptoms, triggers, health and well-being, and therapies that you have found useful in managing your symptoms. By completing the questionnaire you are giving consent for your anonymous responses to be used for research purposes and to be published. Objective: To learn more about motion-induced onset MdDS patients - focusing on onset, symptoms, triggers, health/well-being and therapies. Participant Information: This online survey is for patients whose Mal de Debarquement Syndrome (MdDS) was initially induced by a motion event, even if you are triggered by non-motion events now. You are invited to participate in a research study being conducted by Dr. Cherylea Browne and Dr. Rachael Brown from the School of Science & Health and School of Medicine, Western Sydney University. This research aims to contribute to the understanding of the underlying mechanisms of MdDS. Specifically, this study seeks to collate data regarding the basic clinical features of MdDS, which might be unidentified or overlooked due to the subjective nature of the condition. We aim to collect survey data from MdDS patients, both within the state, nationally and internationally. Participation in this study involves completing an online questionnaire about your MdDS onset, symptoms, triggers, health and well-being, and therapies that you have found useful in managing your symptoms. By completing the questionnaire you are giving consent for your anonymous responses to be used for research purposes and to be published. Objective: Study the safety and effectiveness of an implanted inner ear stimulator system designed to restore vestibular sensation. Participant Information: Please see the Vestibular Implant Study link at www.jhu.edu/vnel for details regarding study inclusion criteria and how to apply to participate. Five subjects will be implanted in the first study. Potential candidates should have bilateral loss of vestibular sensation of at least one year duration, inadequate recovery despite adequate vestibular rehab, good hearing in at least one ear, prior testing (including audiogram, caloric tests, MRI of the internal auditory canals) confirming the diagnosis and showing that they are otherwise healthy, and motivation and ability to undergo implantation surgery and to participate in device activation continuous device use for 3 months, device activation, and quarterly monitoring visits until a year after surgery. Objective: Validate a novel method to measure the extent of loss of vestibular function. Participant Information: We are recruiting a limited number of patients with either bilateral (both sides) or unilateral (one side) loss of vestibular function. Participants wear a pair of goggles and keep head in the upright position and then tilted to each shoulder for a few minutes. As part of this study you will also have vestibular evoked myogenic potentials (VEMP), a standard test used to evaluate vestibular function. You will be compensated for your time for participating in this study. Costs for parking at the Johns Hopkins Outpatient Center Garage will be covered. Location: Johns Hopkins, Baltimore, MD. Contact: Please email [email protected] or phone 410-955-3319 for more information or submitting medical records. Purpose: The goal of the current study is to evaluate the safety, tolerability, and the potential ability of CGF166 delivered through IL-infusion to improve hearing and vestibular function. CGF166 is a recombinant adenovirus 5 (Ad5) vector containing a cDNA encoding the human Atonal transcription factor (Hath1). Why is vision stable during walking? Participant Information:13 Individuals with vestibulopathy (bilateral vestibular loss) and 13 healthy individuals are being recruited for this study. Walking portions of this study (~1 hour including set up) will be conducted at the gait and motion analysis lab at Kennedy Kreiger Institute and the portion of the study involving sitting on a motion platform (~2.5 hours) will be conducted in room 710 in the Ross Building. Any vestibular function testing will be conducted in The Johns Hopkins Outpatient Center, Department of Otolaryngology. For participating in this study you will be compensated $50. Costs for parking at the Johns Hopkins Outpatient Center Garage will be covered. Location: Johns Hopkins, Baltimore, MD. Email [email protected] or phone (410) 564-7828 for more information. 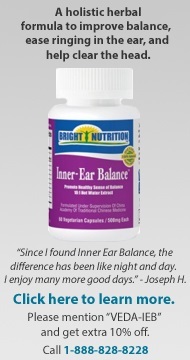 Purpose: To identify the genetic causes of hereditary hearing loss or balance disorders. Purpose: To seek persons with confirmed bilateral vestibular loss to participate in one or more research studies of human balance function. Location: Portland, Oregon. Contact by e-mail. Search for other vestibular research studies here.